While many tourists head straight out of Alicante Airport to their resort, others stop off to enjoy the seaside city of Alicante. Although it is a thriving business and commercial centre , Alicante retains a laidback, cosmopolitan feel. The castle looms over the bustling city. The Old Town is home to fine old buildings with plenty of good restaurants and bars. The marina, with its luxury yachts and boats, is also a magnet for tourists who want to enjoy a fine meal with a sea view. The lush, sandy beaches provide a relaxing haven for workers and tourists alike. Despite its cosmopolitan air, Alicante is faithful to its Spanish roots. You can enjoy the finest paellas and seafood dishes while sampling local beers and wines. The many tapas bars offer a good range of dishes where you can sample local delicacies such as squid, meatballs, snails and plump, juicy olives, for example. Take a trip back in time with a wander around Alicante century San Nicholas Cathedral is nearby. There are also several art galleries and convent in the Old Town as well as the town hall.It's worth popping in to see its Salon Azul (Blue Room). Look for the metal disc on the staircase which is used for measuring the sea levels around Spain. Alicante nightlife is centred around the Old Town with plenty of bars and restaurants from which to choose. Other night owls head for the marina area. The action starts late, possibly 23.00 or midnight, and goes on until the sun rises. The main market is on the Avenue Alfonso El Sabio where you can buy a variety of fresh meat, seafood, fruit, vegetables and cheeses. This is a fabulous place for shopping, particularly if you like your food. Head for the fish stalls as you will not believe the variety of fish and shellfish on offer. The British supermarkets do not compare favourably, that's for sure. The vegetables are very fresh, most are locally produced and they are also much cheaper than in the supermarkets back home. The variety of cheeses on offer is also very impressive - if you look hungry enough, you may get offered a free sample! 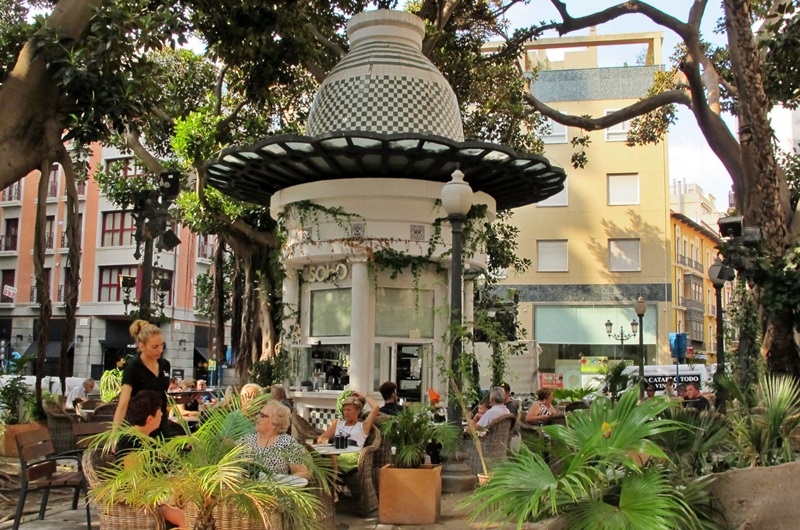 A great way to see Alicante is on foot and the Explanada de Espana is a fine place to start. The palm-lined promenade along the waterfront has many restaurants and bars providing welcome places to stop to try the local cuisine washed down with a cool beer or refreshing glass of wine. From here, you can walk to the port with its impressive marinas providing moorings for hundreds of yachts. 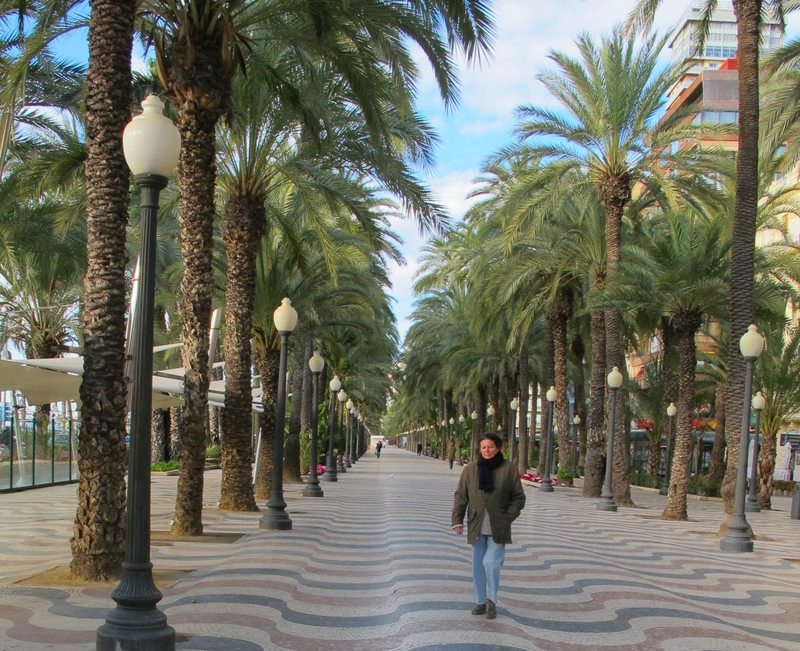 The tourist information centre offers guided walks around various parts of Alicante. The expert guide can tell you more about this interesting city and its history. These include a walk through the old town or via the old monuments and churches. There is also a tourist bus which starts at the port and takes you through the main streets so you can see the city's most interesting monuments and attractions. Further information is available at the tourist information offices in Calle Portugal, by the bus station; Explanada de Espana; Avenida de Salamanca, by the main train station; and Rambla MendezNunez. You can also take the Alicante tourist bus to get your bearings and find out more about this fine city. 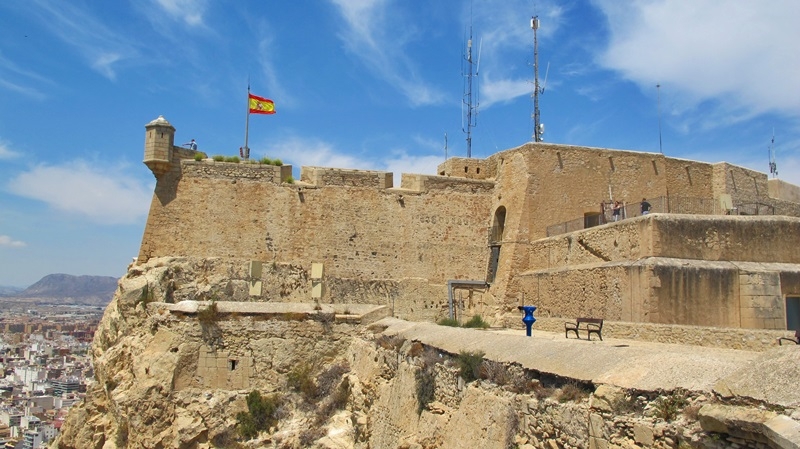 You can't miss Santa Barbara Castle perched high on Mount Benacantil. At its peak, it is 166 metres high. Most of it dates from the 16th century and it is one of Spain's largest medieval fortresses. You get a great view over Alicante city and the Mediterranean from here. Its Holy Communion chapel is considered to be one of the most beautiful examples of Spanish Baroque. The cathedral dates from the beginning of the 16th century. This is Alicante's oldest church, dating from the 14th century. It was built upon the ruins of Alicante's oldest mosque. The monastery is five kilometres from Alicante city. The cloth which it is believed Veronica used to wipe Jesus's bleeding face on the Way to the Cross is housed here. Known as the Museo de la Segurada, the museum has works by the likes of Picasso, Dali, Joan Miro and Juan Gris. The museum is in a 17th century house. It was founded in 1932 and has more than 80,000 pieces from local excavations. You can watch a film about the history of the Alicante area from the Stone Ages to medieval times. Works of art from the Middle Ages to the early 20th century are on display in the 18th century Gravina Palace. The Bonfires of San Juan in mid-summer is Alicante's finest festival. This museum traces the history of the fantastic fiesta with an excellent collection of the statues which were saved from the bonfires, costumes and film clips from previous festivals. If you can plan your trip to coincide with the San Juan festival in June, even better. The Neo-Classical theatre can seat 1,072 people and was opened in 1847. Music, theatre and ballets are staged here with many famous names having performed in this Alicante stage. The cigarette factory in Alicante employed thousands of workers in its 200-year history. Tobacco production moved to the suburbs and the old warehouses were restored and transformed into a top cultural centre. You can get a boat to the peaceful island of Tabarca from Alicante marina, Santa Pola, Guardamar, Benidorm and Torrevieja. Alicante is a compact city and easy to walk around. Make sure you see Postiguet beach, the marina, wander along the Explanada and up the Rambla to the covered market. Definitely visit the castle. It holds interesting exhibitions and you get fabulous city views. Try local dishes, either paella or tapas, which are tasty snacks. Alicante has some lovely home-made ice-creams to try, which are much tastier than the shop varieties. Look for ice-cream parlours in the Rambla and Explanada. Visit the indoor market to see an amazing display of fresh, regional produce plus a colourful flower stall just outside. There are also stalls selling turron (nougat) made in nearby Xixona.